Clemson Girl: Win a pair of Clemson jeans from Football Belles! 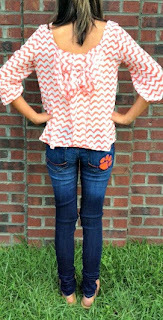 Win a pair of Clemson jeans from Football Belles! We are so excited about today's giveaway from one of our newest sponsors, Football Belles! If you haven't already, you MUST check out their big selection of Clemson apparel, accessories and gifts! Today they have generously offered to give one very lucky Clemson Girl a pair of their new Clemson skinny jeans from Paige Denim. Shown in our original skinny fit, these Clemson jeans feature four-way stretch denim with an authentic fabric construction that gives a classic denim look, with the comfort of high stretch denim. The skinny fit slims through the hips and leg with a comfortable mid-rise. Sizes range from 24-31, and the winner will get to choose a size of their choice. Deadline for entries is Midnight, Friday, August 16. We will randomly draw a winner this weekend and contact the winner by email. The winner will have 72 hours to reply to our email or we will draw a new winner. Special thanks to Football Belles for sponsoring today's giveaway! Good luck ladies! These are so cute! Would pair them with my favorite Clemson shirt and heels! Love to win these to wear to a game! 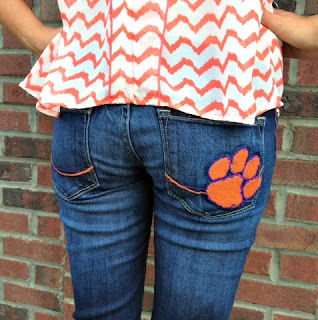 OMG, Clemson blue jeans... Where have these been all my life. I love them. These are so cute!! They'd look great with a pair of boots! Love them! These jeans are PRECIOUS!!! Would love to own them! Love them!! They would be perfect for gamedays!!! I love blue jeans! These would go great on a fall game day with brown leather boots, and a white top and orange cardigan! GO TIGERS! LOVE THESE!!! These will look amazing for tailgating this season! I would wear these with a cute white top, a purple and orange scarf and my super cute brown boots! Love these jeans! Go Tigers!! I would LOVE to have these jeans!!! They would be so cute at games and much more comfortable (to me) than a dress :). These are so cute! I would wear them with flip flops while I watch the game from the comfort of my couch! These are adorable for any CU Tiger girl! LOVE THESE! I would pair with my HOTT cowgirl boots & a super cute shirt! Great for the Georgia game!! These would be great with a solid purple top, cinched with my orange silk ribbon tied in a bow. Along with my metallic jacks or orange flats. I really need these, I've lost 30lbs since April and none of my jeans fit. Buying a brand new Clemson wardrobe in NC is rough! I would pair these cute skinnies with a purple top and my favorite orange statement necklace. Look good coming AND going! Love these jeans!!! With my Gameday Cowboy Boots? TOO CUTE! These jeans are awesome!! They would be a perfect addition to my game day attire! These are so cute! My husband and I are expecting our first child, and these would be extra motivation to lose the baby weight once our little tiger comes...plus so fun to wear during football season! Love these jeans!!! Perfect for a fall game!! These would be great with my orange wedge espadrilles and a cute orange or purple top! Love at first sight! What a great way to show how much I LOVE the Tigers! Can't wait to wear these on game day! I need new Clemson gear and these are so cute!! I would love to have theses!!! My wife said she'd love to wear these to all the Clemson vs. Notre Dame and Louisville games in the upcoming future! Love these!!!! Perfect for chilly game days! Go Tigers!, perfect for any occasion ! these are SO fantastic!! perfect for this southern girl stuck in the north!!! Where were these when I was there!! love them!! I'd definitely pair these adorable jeans with my favorite orange and purple sweater and boots! Awesome jeans for game day! LOVE them!! love these jeans, Cant wait to wear them with boots for the cooler games!! So cute! Pair with an orange tee, cute earrings and sandals! I would wear them with an awesome orange top, of course! Oh I can definitely see those with my jersey and my boots!!!! GO TIGERS!!!!!!!!!! I need those for sure! For the first game, a white or orange tank top with some orange or purple jewelry!